LPBW's Zach Roloff, Tori, and Baby J headed for Maui after Pumpkin Season ended - fun on the beach with their little boy. "Little People, Big World" fans know that Pumpkin Season down at Roloff Farms ended a few weeks back. Tori Roloff and Zach headed to Maui with Baby J. The mini-TLC star fast grabbed the hearts of fans of the Reality TV show and Tori's good about sharing photos. This time, she posted up a photo of little Jackson on the beach and he's just so cute. After a busy Pumpkin Season and a trip to Argentina for Zach to play soccer for North America, it's time to relax. There's nothing quite as special as playing on the beach with little kids. This would really be the first time Baby J's old enough to enjoy building sandcastles and splashing in the wavelets. Hopefully, the family takes lots of pictures for fans. However, the one she shared on Monday night should keep "LPBW" fans happy for a while. The photo shows Tori in an awesome off the shoulder striped swimsuit, and Zach crouched down next to Jackson. Jackson steals the show in his outfit. A big sun hat and his long shorts look too cute. His little toes are scrunching into the sand against a backdrop of the sea. 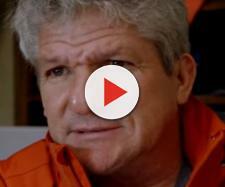 Matt Roloff simply adores his grandchildren and he and Caryn also headed off to Maui. He posted up a photo on his Instagram about it. More than likely, he'll grab some wonderful pictures of Baby J enjoying his beach outings as well. Fans could very well be in for a treat from both Tori and Matt when it comes to photos of Jackson enjoying the seaside. Of course, Zach likes to post stories of his son on Instagram, so keep an eye out if you can't get enough of Baby J. Here's what some of the "Little People, Big World" fans had to say about the first photo Tori posted of Jackson on the beach. @drewwhp: "This is the greatest picture ever looks like so much fun." @haileypeters1: "The cutest little baby belly!" @diane_morag: "Tory, you’ve got a wonderful family with Zac, take care of them so much. " @building2rebuild: "Beautiful family and picture!!" The actual dates of "Little people, Big World's" next season aren't known yet. but Amy hinted at spring. So did Matt Roloff in an interview with Soap Dirt. He said that the family isn't exactly sure, but spring would be a good guess. Fans hope to see more of Baby J and his little cousin Ember in the next season on TLC. Stay up to date with "LPBW" by following Blasting Pop's reality TV channel.